"Joel Brodsky, said Peterson came up with the reward six months after Stacy disappeared because the police were not doing their job" "Six months after his wife's disappearance, Drew Peterson says he will pay $25,000 to get her back." ILL 05/01/2008 (www.suburbanchicagonews.com) "Peterson offers reward for missing wife"
"Six months after his wife's disappearance, Drew Peterson says he will pay $25,000 to get her back. Peterson has claimed all along that his missing wife Stacy stole $25,000 from his safe when she grabbed her bikini and absconded with another man in late October. Now he is offering a $25,000 reward for her "safe return." "It's just another ruse on his part by his PR department," Stacy's best friend and next-door neighbor, Sharon Bychowski, said of the reward Wednesday. "We have had a $35,000 reward for her since the holidays, and (Peterson) laughed at us," said Bychowski, who is skeptical of Peterson's bikini story and believes her friend has met a much more dire end." "Brodsky said it does not matter if the tips lead to Stacy coming home again. In fact, that is of no concern at all. "We don't care if she comes back," he said. "We just want to find her." ??????? "We don't care if she comes back," he said. "We just want to find her." ILL 05/01/2008 (www.suburbanchicagonews.com) "Peterson offers reward for missing wife"
"Peterson's Florida-based publicist, Glenn Selig, said the former Bolingbrook police sergeant "had hoped that by this time Stacy would've contacted him or their four children. But she hasn't. He says he, too, can't fathom why. He says he hopes that this reward will bring her home." "Selig directed tips to the e-mail address stacytips@yahoo.com. "Brodsky says the tips will be opened and read by a team of investigators hired by Peterson, not by Peterson himself or his attorneys," Selig said. "He says all legitimate leads will be forwarded to law enforcement authorities." 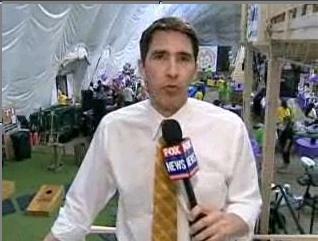 "Brodsky said it does not matter if the tips lead to Stacy coming home again. In fact, that is of no concern at all. "We don't care if she comes back," he said. "We just want to find her."" I have something to do with her disappearance" ILL 05/01/2008 (www.suntimes.com) "Drew Peterson offers reward for Stacy"
"Maybe the money will prompt someone to come forward with a lead," Peterson said in a statement. 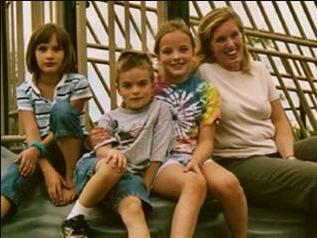 "Her children miss her, and people believe I have something to do with her disappearance. Stacy Peterson's relatives -- who already are offering a $35,000 reward for information -- immediately dismissed Drew Peterson's reward as a ploy. "Offering $25,000 this late in the game is nothing more than Drew seeking media attention," said Pam Bosco, a spokeswoman for Stacy Peterson's family." "All e-mails that contain harassing, obscene or threatening messages are warned that such communications are illegal, and all such e-mails will be forwarded to law enforcement for prosecution," said Peterson's lawyer, Joel Brodsky." "Cales says he has not spoken to Peterson since his daughter vanished" ILL 05/01/2008 (myfoxchicago.com) "Stacy Peterson's Father Testifies Before Grand Jury"
"Drew Peterson and his father-in-law were good friends at one time. They since have had somewhat of a falling out. "We actually got along pretty well," Anthony Cales said of the man police believe had a hand in his daughter Stacy's possible demise. "We were like, pretty good friends," said Cales, who testified Thursday to a grand jury reviewing Stacy's Oct. 28 disappearance. Cales says he has not spoken to Peterson since his daughter vanished." "I think they just have a standard line of questioning for everybody," he said. These questions included: "What's Stacy like?" and "How well I knew Drew" and "Did Stacy ever leave or go anywhere without the kids?" and finally "Did I know about any marital problems or impending divorce, which I didn't," Cales said. "I really don't know anything, you know?" he said." "Cales had been planning to move out to the West Coast but Stacy vanished days before his scheduled departure. 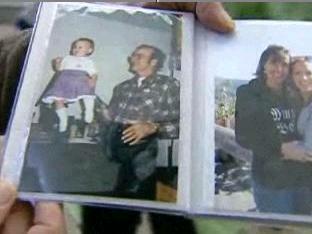 He chose to remain in the area and now struggles with coming to grips with what may have happened to his daughter." "Cales said he took exception to Peterson putting up a reward for Stacy's safe return, calling it "bogus," and said he does not appreciate his son-in-law's occasional TV appearances over the past six months. "I see him on TV," Cales said. "It just burns me up, some of the things he does and says." May 1, 2008 Peterson Neighbor Testifies ILL 05/01/2008 (myfoxchicago.com) "Stacy Peterson's Father Testifies Before Grand Jury"
"Peterson's neighbor, James Mitchem, and his son, Kevin, also testified Thursday [05/01/2008]. Mitchum, the principal of Bolingbrook High School, declined to discuss his appearance before the grand jury." "She [Stacy] was spotted at a Sandals resort in Jamaica." ILL 05/01/2008 (myfoxchicago.com) "Stacy Peterson's Father Testifies Before Grand Jury"
"[Drew] Peterson claims they [Peterson and Anthony Cales] talked a few times, and that they may someday rekindle their friendship. "If Stacy comes back, we'll still be friends," he said. "And then everybody will be mad at her." In an attempt to hasten this, Peterson has put up a $25,000 reward for information leading to her safe return. And the investment is already paying off in numerous tips, he said, including one that she was spotted at a Sandals resort in Jamaica. "She's not in the bushes and weeds, like Sharon and Roy said," Peterson insisted, referring to his next-door neighbor, Sharon Bychowski, and son, Roy Taylor, who have spearheaded the volunteer search effort for Stacy." "Brodsky says Peterson has received news of at least two sightings of a woman resembling Stacy, including one that included a photograph"
"Brodsky says the reward money Drew Peterson is offering will come from a line of credit that has recently been restored to his client." ILL 05/01/2008 (www.wlbz2.com) "Drew Peterson Offers $25,000 Reward For Missing Wife"
"The former Bolingbrook, Illinois police officer is a suspect in his wife's disappearance, but he insists she's still alive. "They are looking for her in barns, bushes and lakes and rivers but nobody is looking for her alive," Joel Brodsky, Peterson's attorney, said after announcing the reward offer. "We're doing this in order to spur some effort, hoping that this reward, which will be in addition to other rewards, so we're talking about a substantial amount of money, will spur people to start looking for her alive in safety somewhere." "Brodsky says Peterson has received news of at least two sightings of a woman resembling Stacy, including one that included a photograph. "There was a sighting in Thailand where we actually got a picture, and a retired police officer who's obviously trained in recognition says that he really believes he saw Stacy," Brodsky said." "If Stacy could see how people are coming to remember her with flowers and other memorabilia she would be so happy, and she would deserve it because Stacy made other people happy," Bychowski said." "When Bychowski moved to Bolingbrook, Stacy was one of the first to greet her, she said." ILL 05/02/2008 (www.wlbz2.com) "Missing, but not forgotten' Fundraiser, flowers show support"
"A front yard on Pheasant Drive in Bolingbrook is filling up with flowers and candles in tribute to missing mother Stacy Peterson. 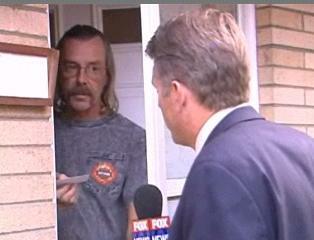 But the front yard is not the address of Peterson, who disappeared Oct. 28. 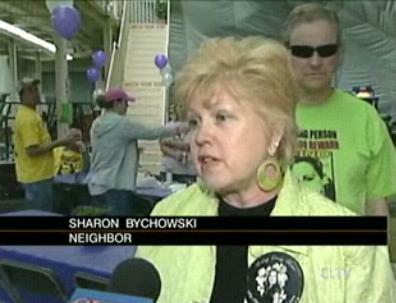 It is the yard of Sharon Bychowski, her neighbor and employer. "I was in London when Princess Diana died, and this reminds me of that," Bychowski said recently, as more and more people arrived to place bouquets of flowers to honor the missing woman as the sixth-month anniversary of her disappearance approached. "I've had three florists bring flowers today. One woman came and placed flowers and made the sign of the cross. We are more determined than ever to bring her home," Bychowski said." "Throughout the neighborhood, people have tied blue and pink ribbons on trees to honor Stacy Peterson. "Stacy is full of life. People were happy to be around her. She is an amazing 23-year-old," said Bychowski, who is one of four directors of the Friends of Stacy Peterson Family Fun-Raiser set for 5 to 9 p.m. May 10 at Ditka's Sports Dome & 46 Zone Bar and Grill at 730 N. Route 53 in Bolingbrook." "Peterson was simply helping a young woman who works at a tanning salon he sometimes visits, Peterson's attorney said." "Insisting she wasn't a girlfriend. "Let's call her a friend," said Peterson"
"That's just the type of guy he is," said attorney Joel Brodsky." 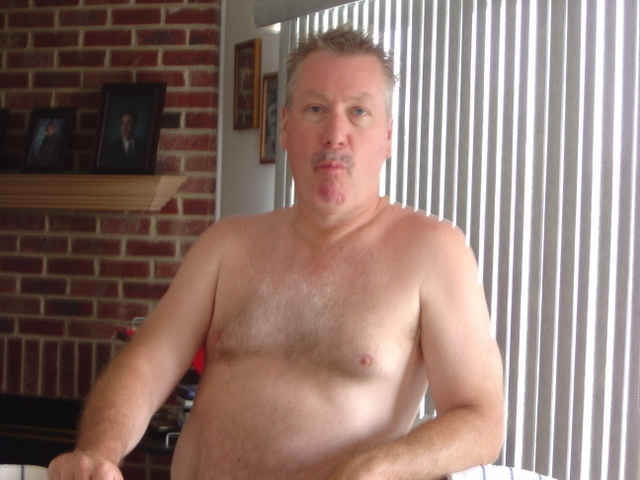 ILL 05/09/2008 "Drew Peterson pulled over for speeding on way to help 'friend'"
"Drew Peterson was in such a hurry to pick up a 22-year-old female friend who needed a ride May 3 that he got stopped for speeding by Naperville police. But the former Bolingbrook Police officer avoided a ticket, instead receiving a warning after being curbed about 2:30 a.m. May 3 in Naperville. Peterson, 54, said he was stopped on his way to pick up a friend who called him for a lift after the driver of the car in which she was riding was taken into custody by Naperville police." "I was just being a good Samaritan," he said, declining to identify the woman, but insisting she wasn't a girlfriend. "Let's call her a friend," said Peterson, whom police have labeled a suspect in the Oct. 28 disappearance of his wife, Stacy Peterson, 23. Naperville police confirmed that Drew Peterson had been stopped. A source said Peterson was travelling less than 10 miles over the posted speed when he was stopped." "Peterson was simply helping a young woman who works at a tanning salon he sometimes visits, Peterson's attorney said. "That's just the type of guy he is," said attorney Joel Brodsky." May 6, 2008 - ILL 05/06/2008 (www.dahl.com) "Steve Dahl Show Log"
"8:54 Drew still has the reward out for $25,000 for information that gets Stacy back alive. So if Buzz found Stacy, he'd get a $25,000 check from Drew with the amount written out and line across it so he can't alter the amount. Then Drew would write "Find Stacy" in the memo box so he'd know what the check was for." donates workout sessions ILL 05/07/2008 (suburbanchicagonews.com) "Morning Briefing"
"Company donates to Peterson fundraiser - Tease Workout of Naperville is donating two eight-week workout sessions to the auction of the Stacy Peterson Family FUN-raiser being held from 5 to 9 p.m. May 10 at Ditka's Sports Dome & 46 Zone Bar & Grill in Bolingbrook. Visit www.teaseworkout.com or call 630-901-9697"
May 8th somebody is scheduled to appear before the Grand Jury ???? ILL 04/24/2008 (findstacypeterson.com) Thread Title, "Grand Jury Question"
"Latest news I have on the boys going to GJ, the date will be decided in court on the 29th? I guess we'll have to wait and see? I do know of someone being called May 8th, so it appears to me they are not done, and I'm expecting GJ will go loner than the previously stated 6 months....makes me sad, but again that patience thing. Anxoius to hear who will be at the GJ today!" Steve Maniaci Testify ILL 05/08/2008 "Relatives of Drew Peterson's former wives testify before grand jury"
"Relatives of Drew Peterson's former wives testified Thursday before a Will County grand jury investigating the death of his third wife and disappearance of his fourth wife." - "Savio's sister, Sue Doman, testified for about an hour as did Lisa Ward, the daughter of Peterson's second wife, Vicki Connolly. A third witness was Steve Maniaci, who was dating Savio at the time of her death, Doman said." 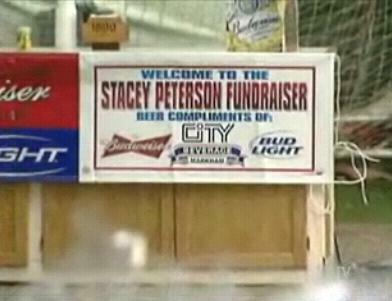 May 9, 2008 "We're doing it on the weekend of Mother's Day to honor Stacy and all the other great mothers just like her," said Sharon Bychowski" ILL 05/09/2008 "Drew Peterson pulled over for speeding on way to help 'friend'"
"A group dedicated finding missing mom Stacy Peterson will raise money on Mother's Day weekend to search for her. "We're doing it on the weekend of Mother's Day to honor Stacy and all the other great mothers just like her," said Sharon Bychowski, Stacy's best friend and next-door neighbor." "May 10's "FUN-Raiser" at Ditka's Sports Dome & 46 Zone Bar and Grill will feature contests, tournaments, various auctions and raffles, and music. Tickets for the event at the 730 N. Bolingbrook Drive entertainment and recreation facility are $25 for adults and $10 for children. 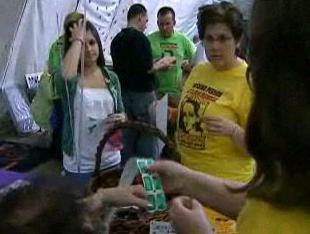 A two-adult, two-child "family fun pack" costs $65. 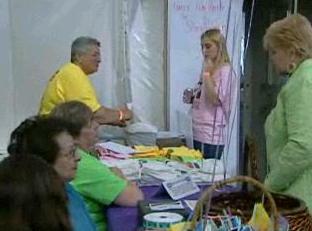 Proceeds from the event will help pay for the volunteer search effort for Stacy Peterson, the young mother who vanished Oct. 28." "If he was smart, he took the Fifth," Brodsky said of Maniaci. "If it was my girlfriend who was found dead, and it was declared a homicide, and I had the code to the alarm system, and there were no signs of forced entry, I would have a lawyer with me." "Maniaci spoke to Savio on the phone two nights before she was found drowned in her dry bathtub in March 2004" ILL 05/08/2008 (suburbanchicagonews.com) "Attorney: Police have tunnel vision"
"Sue Doman, the sister of dead third wife Kathleen Savio, said Savio's former boyfriend, Steve Maniaci, testified before her Thursday. Maniaci spoke to Savio on the phone two nights before she was found drowned in her dry bathtub in March 2004." "Did couple break up? Peterson's attorney, Joel Brodsky, claims Maniaci and Savio broke off their relationship the weekend before she was found dead. "If he was smart, he took the Fifth," Brodsky said of Maniaci. "If it was my girlfriend who was found dead, and it was declared a homicide, and I had the code to the alarm system, and there were no signs of forced entry, I would have a lawyer with me." Maniaci could not be reached for comment. Savio's niece, Melissa Doman, disputed Brodsky's assertion. "No. If memory serves me correctly, he was at my aunt's wake," Melissa Doman said. "Why would he be there if they broke up?" "State police have not named suspects in the Savio homicide." - "Brodsky said that instead of focusing on Peterson for Stacy's disappearance case, police should be turning an eye to others. "They're got tunnel vision," Brodsky said. "I'm not just whistling Dixie." FUN-raiser ILL 05/09/2008 "Drew Peterson pulled over for speeding on way to help 'friend'"
"For more information on the event, or to sponsor it, visit the Web site www.findstacypeterson.com. Bychowski said Advantage Chevrolet of Bolingbrook has stepped up to contribute $1,000 to the event and to chip in with $50 worth of gasoline cards and four $25 gift cards for Woodlands restaurant at the Promenade. "We're doing it because it needs to be done," said Jim Galbraith of Advantage Chevrolet. 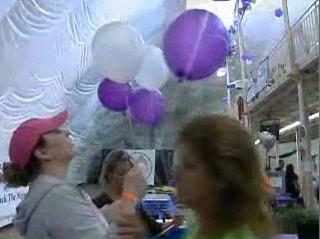 Galbraith said the dealership is trying to do its part in the community. "We're actually not doing it for the publicity as much as because it needs to be done," he said. "Sometimes the unsung heroes are the best heroes, and if people just did good things, we'd have a lot less problems." April 08, 2008 Stacy Peterson Search Fundraiser ILL 04/08/2008 (findstacypeterson.com) "Ditka's Sports Dome fundraiser - Saturday, May 10"
The lovely Bolingbrook Village Clerk and Friends of Stacy Peterson committee member Carol Penning is organizing a fundraiser, with proceeds going to the search fund. 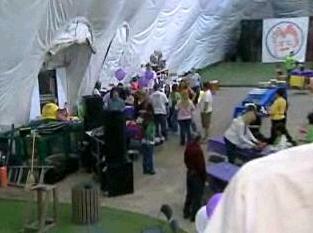 Price of ticket includes food, pop, beer, and driving range. Tickets will soon be available for purchase online at www.groovetickets.com. 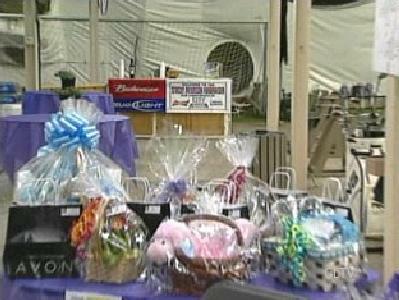 There will be chipping, putting and target contests, a bean bag tournament, silent auctions, raffles and split-the-pots. 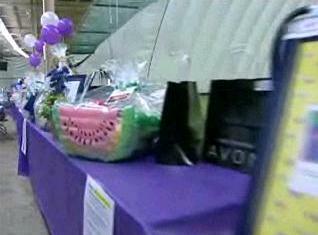 If you would like to donate items or services for silent auction or raffles, please contact Carol at 630-300-4207. 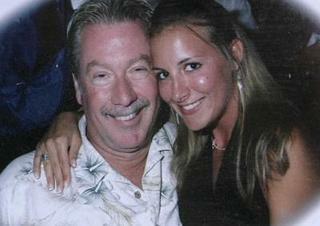 Flash Back From Ashley's BlogSpot - Drew Peterson BUSTED ! Drew: "Why have you shut me off" - Ashley: "I know you are a player Drew" - Drew: "I really have been cuz i havent found the right woman. I thought I did but she stopped giving me the time of day." . CLICK HERE for Photo Properties that show the date this digital photo was taken was June 6, 2004 at 12:58 PM NICE TRY !! Nice Try but NO cigar ! ILL PROPAGANDA PLANTERS CIRCULATING JUNE 6, 2004 PHOTO OF DREW PETERSON ! It doesn't take a rocket scientist to read property records for a digital file. The properties link for this picture of Drew Peterson being distributed on the Internet shows it was taken with a SONY DSC-P10 camera and uploaded to a PC on June 6, 2004 at 12:58 PM. 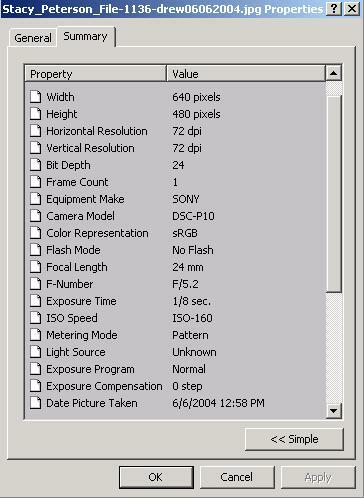 The fact that all the "properties information" is still embedded within this digital picture proves it came directly from either the original PC file that was downloaded from the SONY DSC-P10 camera on 06/06/2004 or a CD where that file was stored and NOT that it was a print copy of the picture in a photo album, for example, that was scanned later to upload to the Internet. Further, the *date* being embedded also proves that somebody didn't later use a Sony DSC-P10 camera to take a picture of a printed photo. There is no doubt that this is a PROPAGANDA PLANT distributed on the Internet to make posters think this is a current pic of Drew probably at the tanning salon or in some new chickie's bedroom. Nice try but no cigar! May 12, 2008 - ILL 05/12/2008 (Nancy Grace) "Former Agent Says Simpson Confessed to Murders"
"They're valuable property my client legally owns," Brodsky said of the weapons, which he estimated are worth $10,000. "It's time for the weapons to be taken out of the state's hands." "There's no compelling need to return these items to a family member of Drew Peterson in the middle of what could be a murder investigation," prosecutor John Connor argued during the hearing." ILL 05/13/2008 (www.suntimes.com) "Judge: No guns for Drew Peterson"
"Drew Peterson won't be getting back 10 guns authorities seized last year, but his police officer son appears likely to end up with the weapons, Peterson's attorney said today" - ""This court is of the opinion the state cannot withhold the firearms indefinitely," said Judge Richard Schoenstedt, who deferred a formal ruling until later this month on the request by Peterson for the release of the guns. Peterson and his attorney have sought to get the guns back for months. In February, Schoenstedt ordered investigators to return two vehicles, two computers and the guns to Peterson — but authorities blocked the return of the guns by revoking Peterson's firearm owners identification card." "There's no compelling need to return these items to a family member of Drew Peterson in the middle of what could be a murder investigation," prosecutor John Connor argued during the hearing. He [Joel Brodsky] and co-counsel Andrew Abood have argued the weapons —a variety of shotguns and pistols —belong to Peterson and can't be held indefinitely while police investigate Savio's death and Stacy Peterson's disappearance. "They're valuable property my client legally owns," Brodsky said of the weapons, which he estimated are worth $10,000. "It's time for the weapons to be taken out of the state's hands." "Meanwhile on Tuesday, State Police Sgt. 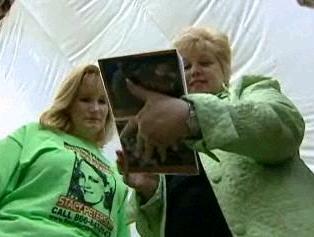 Thomas Burek said authorities remain confident the Stacy Peterson case will be solved. "We're real comfortable in the way it's moving," he said. "We are confident that there will be an arrest." "Last fall, more than five dozen state police investigators were assigned to the case, and Burek said the size of the team remains the same." ILL 05/14/2008 (ChicagoTribune) "Drew Peterson may be allowed to transfer his guns to son"
"A Will County judge indicated Tuesday he is open to letting Drew Peterson transfer ownership of his firearms to one of his adult sons but said he will issue a final decision this month. Peterson and his attorneys, Joel Brodsky and Andrew Abood, appeared to have won the return of the guns Feb. 27, when Schoenstedt ordered police to give them back provided he had a valid FOID card. The victory was short-lived: Within hours, the state police revoked Peterson's card at the request of State's Atty. James Glasgow. Brodsky then asked Schoenstedt to allow Peterson's son Steven, an Oak Brook police officer, to take the weapons. When that motion was denied, Brodsky asked that his client be allowed to transfer ownership of the guns to the son." "Meanwhile on Tuesday, State Police Sgt. 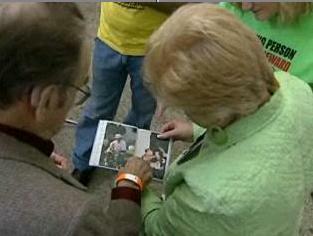 Thomas Burek said authorities remain confident the Stacy Peterson case will be solved. "We're real comfortable in the way it's moving," he said. "We are confident that there will be an arrest." Last fall, more than five dozen state police investigators were assigned to the case, and Burek said the size of the team remains the same. Though he would not reveal where investigators have searched or are searching, Burek said there are no plans for major water searches"
"remembered inking a cap for a friend named Paula who babysat his kids when he traveled to New York to appear on the "Today" show." ILL 05/15/2008 (www.upi.com) "Signed Drew Peterson cap auctioned on eBay"
"A baseball cap purportedly signed by a former Illinois police officer suspected in the disappearance of his fourth wife is being auctioned on eBay for $1,000. 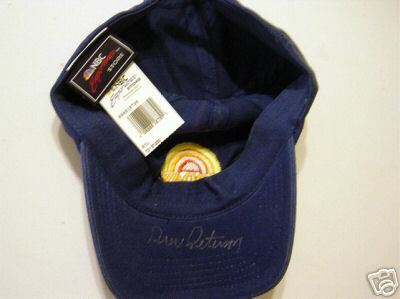 Bidding for the "Authentic Autographed Drew Peterson Today Show Cap" opened at $1,000 Wednesday, but the item has yet to attract a bid, the Chicago-Sun Times reported Thursday. Peterson is being investigated in the October disappearance of his fourth wife and the death of his third, whose body was found in the bathtub of her Bolingbrook, Ill., home in 2004." "Peterson initially said he had nothing to do with the signed eBay cap, but later remembered inking a cap for a friend named Paula who babysat his kids when he traveled to New York to appear on the "Today" show. 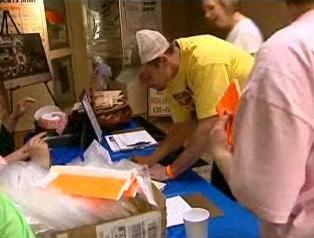 It is reported Paula's mother may be the person auctioning off the hat." 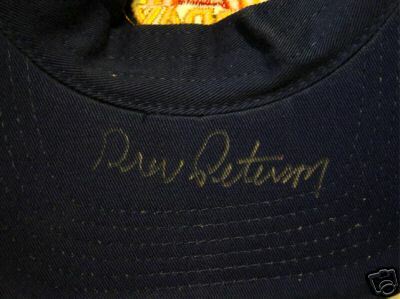 Peterson's Signature Drew Peterson reportedly gave the hat to Paula Stark, who in turn reportedly gave it to her mother to sell on ebay ILL 05/15/2008 "Authentic Autographed Drew Peterson Today Show Cap Item: 230251767173"
This auction is for an authentic autographed Today Show cap signed by Drew Peterson when he appeared on the Today Show to discuss the disappearance of his wife Stacy. The cap is new with tags still attached and signed in silver ink on the underside of the bill (see pictures for a close up of the signature). 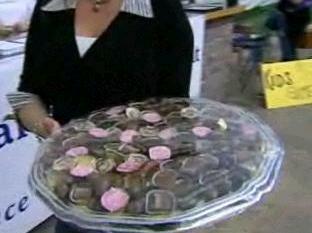 It is being sold for a friend who knows Drew Peterson and was present for his appearance on the Today Show. This item is sure to gain in value as the case concerning Drew Peterson progresses. Don't miss out on this amazing piece of history! May 15, 2008 Anna Doman testifed before Grand Jury ILL 05/15/2008 (wordpress.com) "Kathleen Savio’s sister testifies before grand jury"
"A sister of Drew Peterson’s deceased third wife testified Thursday before the grand jury investigating Kathleen Savio’s death and the disappearance of Peterson’s fourth wife, Stacy. Savio’s sister Anna Doman confirmed she had testified but declined to comment any further as she left the Will County Court Annex building Thursday. Doman is the second family member called to testify before the grand jury. Last week, her sister Susan Doman testified, as well as Steve Maniaci, Savio’s boyfriend at the time of her death." 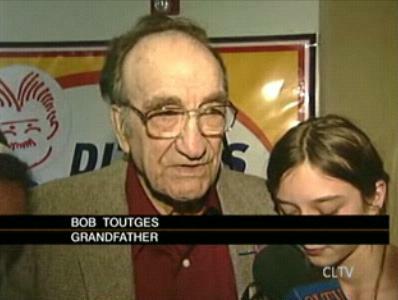 May 15, 2008 Rich Berg testifed before Grand Jury ILL 05/15/2008 (chicagotribune.com) "Kathleen Savio's sister testifies before grand jury"
"Also appearing before the grand jury was Rich Berg, a Bolingbrook patrol officer. Berg referred all questions to Illinois State Police. Sgt. Thomas Burek of state police said he could not comment." CLOSED ! ILL 05/15/2008 (findstacypeterson.com) "www.findstacypeterson.com FORUM CLOSED"
"We are restructuring our site to become an information based only site. Thank you to all who have contributed to this forum. Just because we have closed the forum does not mean we are giving up. We will continue to search for Stacy until she is found! Please continue to visit the main website for updates on searches and events going forward. http://findstacypeterson.com"